Artificial intelligence, neural networks, machine learning – what do all these hyped terms really mean? For most non-technically savvy people, they seemed to be something fantastic connected with speaking robots and living machines, but in fact, their essence lies close to the surface. We’ve scribbled an article about the innovative concept of neural networks (which are the basis for AI and ML) in simple language describing how they work, their history and prospects in the world of high technology. For the first time, the concept of artificial neural networks (ANN) arose during the process of simulating a brain. The development of a revolutionary artificial neuron model by McCulloch-Pitts and his scientifical team in 1943, was a real breakthrough in this promising direction. Scientists decided to design it in the format of a network connecting the elements to perform logical operations. The most important achievement was demonstrating a network is capable of training and improving its abilities. The era of great discoveries began. In 1949, Donald Hebb implemented the first algorithm for ANN computing which became the foundation for further developments over the next few decades. This discovery was complemented by the creation of a special system stimulating brain processes called perceptron in 1958 by Frank Rosenblatt. It’s worthy to note no one has managed to top Rosenblatt’s invention, and it is still a fundamental incentive system for neural networks. 8 years later, in an incredibly random way, two scientists, from the US and Soviet Union, without cooperation, almost simultaneously determined the method of training a multilayer perceptron. In the 21st century, in 2007, neural networks were literally reborn due to the work of British computer scientist, Jeffrey Hinton, who developed an algorithm for deep learning with multi-layer neural networks. It is now, for example, is used for running unmanned vehicles. Avoiding complex statements and a conglomerations of terms, we can describe the neural network as a device functioning on the principles of the human brain. ANNs are divided into numerous types, including convolutional, recurrent, directly distributed, and so on; they differ based on tasks performed (i.e., analysis, forecasting, pattern recognition, etc.) and structure. No matter what type of network we consider, we are dealing with a mathematical model represented in the form of software and hardware,\ and aimed at learning to draw conclusions based on constantly updated data. This is equal to the process of how a person makes decisions. This description may cause some misunderstandings and confusion, and your question “What is the difference between an artificial neural network and another software program?” is fairly expected. To put the puzzle together, we answer the main criterion differing a neural network from an ordinary computer program is its ability to learn. Consequently, the resulting work of a neural network is based on data not existing at the initial stage. Its development was caused gradually by incoming information during the learning stages. We’ve figured out the neural network is a mathematical model built on the principles of how bionic neural networks function. All further explanations of its mechanism of its work are closely connected with the concept of multilayer perceptron as the first embodiment version of this system. A multilayer perceptron is a hierarchical computing model consisting of a great number of neurons(processors). Separately, these processors are quite simple (much simpler than a personal computer processor), but if you connect these neurons in a single, large system, they become capable of performing extremely complex tasks. What’s more, a neural network has multiple inputs and one output. The calculation algorithm determines the way incoming signals are formed into the output. Effective values are passed to each input of the neuron, which then distributes them through inter-neural connections (synopsis). The main parameter of a synapsis is weight, the responsibility for changes of the input information during the transition from one neuron to another. If this definition still confuses you, let’s analyze the most simple example illustrating the mechanism of ANN work, color mixing. 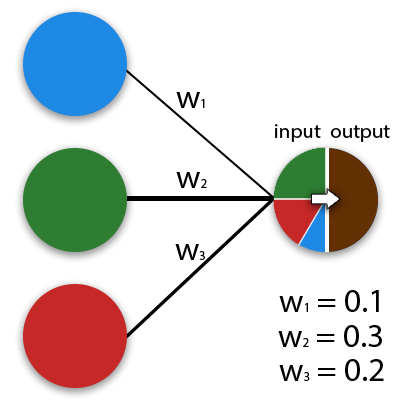 Green, red and blue neurons have different weights. The information existing in a neuron with a larger weight dominates in the next neuron. Depending on the field of application, we can consider the neural network from different angles. For example, if we assess it in terms of the machine learning, ANN is a method of pattern recognition. From the point of view of cybernetics, it is a model for adaptive robotics control. Speaking of its relation to AI, a neural network is a fundamental component for modeling natural intelligence using computational algorithms. We repeat the main advantage of neural networks over conventional computing algorithms is their learning capability. In this case, learning is about finding correct coefficients of connection between neurons, generalizing data and determining complex dependencies between input and output signals. In fact, the successful training of a neural network means the system is able to identify the correct result based on data not available in a training sample. When analyzing the mechanism of ANN work and its wide features, you may naively think we are using neural networks for performing numerous human tasks or replacing human potential with the power of technology. However, we’re here to reveal an important truth: ANN is far from the capabilities of the human brain and thinking. The biggest difference, radically changing the principle and efficiency of the computing system, is the weaker signaling in artificial neural networks in comparison with the biological network of neurons. In ANNs, neurons transmit number values. In the human brain, impulses are transmitted with a fixed amplitude, and they are almost instantaneous. This leads to the obvious advantage of natural intelligence over artificial one. Nevertheless, humanity trusts neural networks in various areas: creation of self-learning production systems, unmanned vehicles, image recognition systems, intelligent security systems, robotics, quality monitoring systems, voice interaction interfaces, analytics systems, and much more. The market for neural networks is incredibly huge. It’s billions of dollars, and the demand grows in lock step with the emergence of new methods accelerating the ANN training process.